Did you know that most health insurance covers massage therapy when provided at our chiropractic office? Massage therapy when provided along with chiropractic care can be a highly effective treatment for most musculoskeletal conditions. 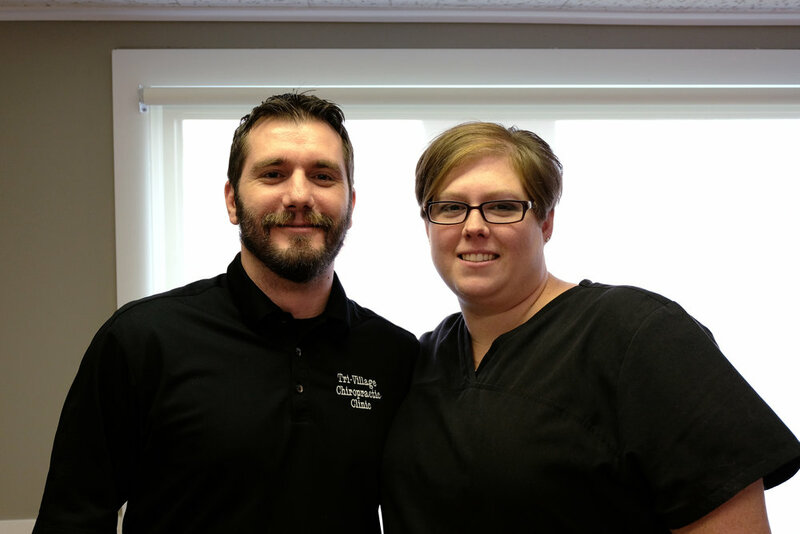 Tri-Village Chiropractic has 2 licensed massage therapists that are fully trained in deep tissue massage, sports massage and myofascial release therapy. The hours available are the same as our general office hours. We offer 30 and 60 minute massages. Deep Tissue: The focus is on the deepest layers of muscle tissue, tendons and fascia. Deep tissue pressure is beneficial in releasing chronic muscle tension. Myofascial release: connective tissues called fascia surround the muscles, bones, nerves and organs of the body. Myofascial release is a manipulative treatment that attempts to release tension in the fascia due to trauma, posture or inflammation. Trigger Point/Neuromuscular Therapy: Localized areas in which the muscle and connective tissue are highly sensitive to pain when compressed. Pressure on these points can send referred pain to other specific parts of the body. Trigger point therapy can relieve muscular aches and pains in association with these areas.